orchestra is arranged in a horse-shoe shape. It was extended and restored during the reign of Augustus at the personal expense of the Holconius brothers, who were rich Pompeian vine growers. An inscription tell us that the entire seating area had been resurfaced in marble, but this was removed and carried off after the destruction of the town. The upper circle was added to increase the seating capacity and the two side boxes above the entrance to the orchestra were reserved for the guest of honour. In this way the theatre of Pompeii could accommodate 5,000 people seated in three different areas which were separated by corridors. 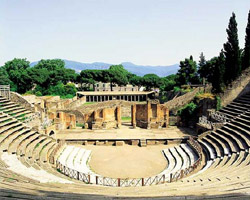 The first (called the ima cavea) was situated in the orchestra itself and had four rows of seats which were reserved for the decurions, while the first rows of the media cavea were for the representative of the corporations: one of these was reserved for the eldest of the Holconium brothers and was identified by an inscription in bronze letters. The remaining places right up to the top part (summa cavea) were designated for the ordinary townspeople. The final tier had stone rings fitted into the walls which were used to support the poles which held the large canopy covering the theatre to protect the audience from the sun. The stone stage was rebuilt after the earthquake of 62 A.D. in imitation of the façade of an important building decorated with column, niches and statues,. To the rear was a small and unusual-shaped dressing room running the whole width of the stage area, which could be reached by three doors directly from the stage. A further three doors lead out onto a large courtyard.